A new compound, catechin-3-O-α-L-rhamnopyranosyl (1→4) β-D-glucopyranoside was isolated from the ethylacetate soluble fraction of the aqueous extract of the whole seeds of Trichilia emetica (Family: Meliaceae). The structure of this compound was established on the basis of nuclear magnetic resonance (NMR), Infrared (IR) spectroscopy and ultraviolet-visible (UV-vis) spectrophotometry. The compound was also subjected to antimicrobial activity and brine shrimp lethality bioassay. The pure compound showed either no or reduced activity against microorganisms tested, it also showed no cytotoxicity. L. R. Ferguson, Mutat, Res. 2001, 475, 89. D. Marinova, F. Ribarova, M. Atanassova, Journal of the University of Chemical Technology and Metallurgy, 2005, 40, 255. M. P. Germanò, V. D’Angelo, R. Sanogo, S. Catania, R. Alma, R. De Pasquale, G. Bisignano, J. Ethnopharmacol. 2005, 96, 227. M. P. Germanò, V. D’Angelo, T. Biasini, R. Sanogo, R. De Pasquale, S. J. Catania, Ethnopharmacol. 2006,105, 368. Y. Frum, A. M. Viljoen, Pharmacol. Physiol. 2006, 19, 329. S. G. Sparg, J. van Staden, A. K. Jager. J. Ethnopharmacol. 2000, 73, 209. K. K. Atindehou, C. Schmid, R. Brun, M. W. Kone, D. Traore, J. Ethnopharmacol. 2004, 90, 221. S. Hoet, F. Opperdoes, R. Brun, V. Adjakidje, J. Quetin-Leclercq, J. Ethnopharmacol. 2004, 91, 37. L. Li‑Jing, H. Xiao‑Bing, L. V. Zhen‑Cheng, Springer Plus. 2016, 5,1649. D. Diallo, B. S. Paulsen, T. H. A. Liljeback, T. E. Michaelsen, J. Ethnopharmacol. 2003, 84, 279. B. M. Komane, E. I. Olivier, A. M. Viljoen, Phytochem. Lett. 2011, 4, 1. M. Nakatani, J. C. James, K. Nakanishi, Phytochemistry. 1985, 24, 195. M. Nakatani, J. C. James, K. Nakanishi, J. Am. Chem. Soc. 1981,103, 1228. A. A. L. Gunatilaka, V. S. Bolzani, E. Dagne, G. A. Hofmann, R. K. Johnson, F. L. Mccabe, M. R. Mattern, D. G. I. Kingston, J. Nat. Prod. 1998,61, 179. M. Traore, L. Zhai, M. Chen, C. E. Olsen, N. Odile, G. I. Pierre, O. J. Bosco, G. T. Robert, S. B. Christensen, Nat. Prod. Res. 2007, 21, 13. A. Usman, V.Thoss, M. Nur-e-Alams, J. Nat. Prod. Resour. 2018, 4, 179. 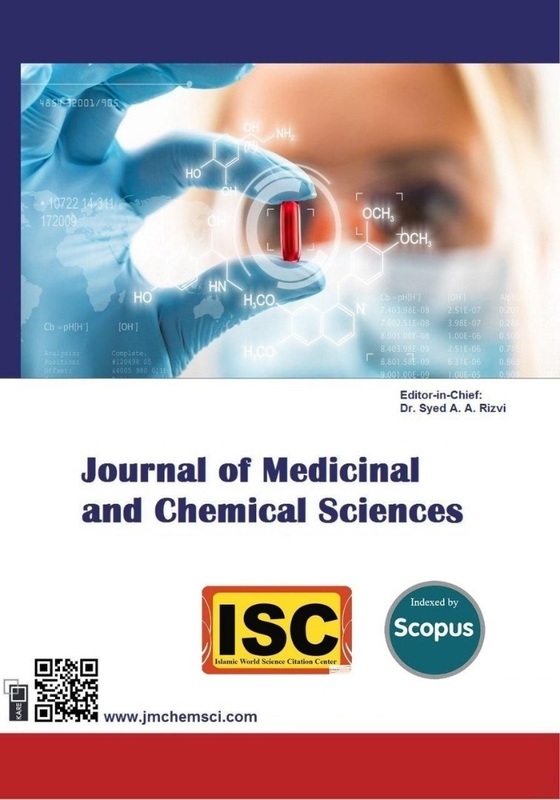 S. P. V. Chaturvedula, I. Prakash, Journal of Applied Pharmaceutical Science. 2011, 1,104. I. A. Ruiz-Matutea, O. Hernandez-Hernandezb, S. Rodriguez-Sanchezb, M. L. Sanzb, I. Martinez-Castrob, Journal of Chromatography B, 2011,8791,226. K. Nahar, M. G. U. Khan, M. S. Rahman, B. Begum, M. A. Rashid, Dhaka Univ. J. Pharm. Sci. 2008, 7, 99. B. N. Meyer, N. R. Ferringni, J. E. Puam, L. B. Lacobsen, D. E. Nichols. J. L. McLaughlin Planta Med. 1982, 45, 31. S. Nishat, N. Nahar, M. Mamun, M. Mosihuzzaman, N. Sultana, Dhaka Univ. J. Pharm. Sci. 2006, 54, 229. K. Ishimaru, G. Nonaka, I. Nishioka, Phytochemistry 1987, 26, 1167. U. Takahama, R. Yamauchi, S. Hirota, Food Chem. 2013, 141, 282. (a) S. Sajjadifar, Chem. Methodol. 2019, 1, 1-11; (b) H. Veisi, A. Sedrpoushan, P. Mohammadi, A.R. Faraji, S. Sajjadifar, RSC Advances 2014, 4, 25898; (c) S. Sajjadifar, M.A. Zolfigol, G. Chehardoli, S. Miri, International Journal of ChemTech Research 2013, 5, 422; (d) E.R. Nezhad, S. Sajjadifar, Z. Abbasi, S. Rezayati, Journal of Sciences, Islamic Republic of Iran, 2013, 25, 127.